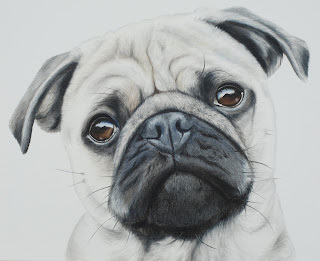 Some of you may remember the Pugs I painted a while back, all 5 on one canvas.... well they have a new friend! Herbie! So it was only right that he needed to have a portrait done too, didn't want him to feel left out. So the Pugs popped round for another photoshoot, Ned (My Sprocker Spaniel) still looked as confused as ever after the garden was over run by this 'herd' of pugs, is there a word for a group of Pugs I wonder?